A “must have” from Steiff’s 2005 North American Exclusive line. 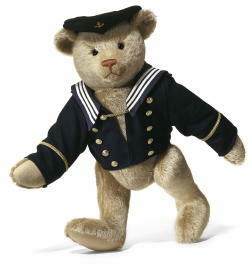 Bring some turn-of-the-century nostalgia to your Steiff collection with Teddy Kapitan. This 22", five-way jointed classic is made from sun-bleached looking blond mohair. He is handsomely attired in a dapper navy blue uniform jumper, complete with nautically-inspired buttons and trim. You’ll love his matching seafaring beret, his earnest expression, and stocky build—this proud sailor certainly has his “sea legs”!